The Dutch find incredibly creative and simple ways to communicate important messages to the masses. They put a lot of time and effort into public outreach and communication, which from my observation over the past 8 months, has had a very powerful effect on increasing understanding and building support for government (and other) actions. What could it mean for the United States? (gasp) even demonstrate conveyance options in/around/under/through/upside-down/inside-out of the California Bay-Delta. In the Netherlands, it is not uncommon to find large nice posters plastered all over public works projects to explain to the public why it is their train station is under construction yet again. I rarely hear people cursing the delays (or at least significantly less than in the United States) as a result of it because they understand what the long-term goal is. 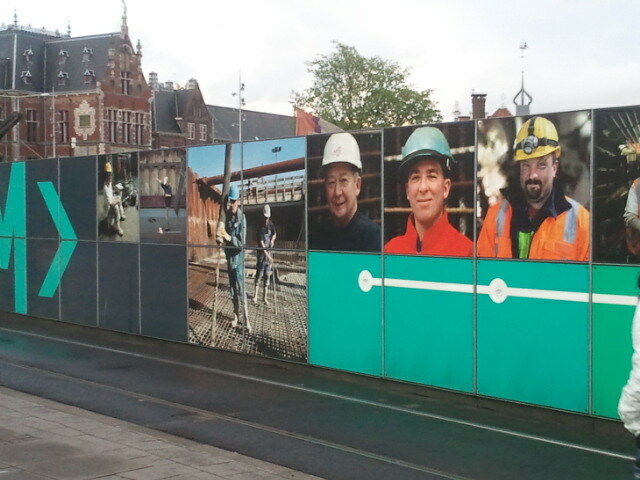 You also commonly see billboards depicting the future of Amsterdam’s harbor (and how the people will be a part of it!). These signs at Delft Station takes you to the website where you can learn about the new train station modifications in Delft. I just came across the following and feel compelled to share: At one minute-long each, hydrologists, engineers, and animators provide even children a “Primary school” understanding on the “Room for the River” program. These animations explain the (rather) complicated hydraulic processes of giving room to river with the story of the Sheep Sieb (Schaap Sieb). Other links on the site also show how the Dutch are trying to involve young adults in water management early on. I think these approaches are useful beyond targeting young people, however. Such concepts for a video, unmuddeled by opinion or technical jargon, can really help explain to stakeholders (including educated decision-makers) what we all mean when we’re talking about such things. I’ve embedded a few of these (what I believe to be) fantastic videos here. You do not need to know Dutch to appreciate them. But feel free to check out the site for the complete set. Key words : “dijk”= dike/levee “overstroming”= flood. “Hoogwater”= high water. This entry was posted in Uncategorized and tagged communication, flood, media. Bookmark the permalink. 3 Responses to Can the Dutch teach us something on the power of communication? Interesting to see how the view from the US is different from those living in Amsterdam. I have not seen the posters you mention. There are thousands of complaints daily about the delays, the garbage, the lack of information, the disinformation and the manipulation by public transport companies, especially the trains. There have been complaints for years, up to the ministerial level. Yet, the mess seems to be greater by the week. The national government has just installed an ombudsman for these issues. Coming back to the topic of the post: there have been interesting PhD studies by Twente University about the role of information for decision taken by citizens in relation of flood risk. It comes down to that more information or better information has no influence on decision-making in relation of flood risk. As an example, even the best informed water policy advisors, who work with the issues on a daily basis, are not prepared for floods. Thanks for your comment. It is interesting to hear there is quite some frustration that you mention (but I take your word for it) as my post was written from my experience here with Dutch friends/colleagues. Thanks for the suggestion about the Twente STudy. I am quite familiar with this group and with the project. And yes, I am familiar that some people say that more/better information doesn’t influence decision making at the individual level. With respect to today’s post, I was more thinking about hot topics that we face in the US, in California especially, where there have been a number of larger-scale projects proposed that may have significant positive (or negative, depending on how you ask) impacts on flood risk, ecosystem, agriculture, and water supply reliability. There is political gridlock (understandably so) with decisions on these things. However, I think that that a lot of angst from the general public comes from a lack of understanding exactly what is on the table because no one is really reaching out to them. I think that if these types of projects could be communicated more clearly, we could have a public that is better informed, a bit less anxious, and we could have more positive discussions about these things, the gives and takes, and what is the best solution for everyone– rather than a face-off and a strong “no” on both sides. I could be wrong, but its’ worth a shot. Just a difference I have noticed anyway. Jessica – I’d be interested in knowing more about the institutions behind the videos/posters/etc. It strikes me that institutional consensus is required in order for everyone to agree on what needs to be done, which is then communicated through the videos, which then feeds back to strengthen political support for the institutional consensus. Is that how this works? I’m trying to imagine how this sort of process might map to the Sacramento Bay-Delta system, where as yet we’ve got no institutional consensus to turn into a cool video.